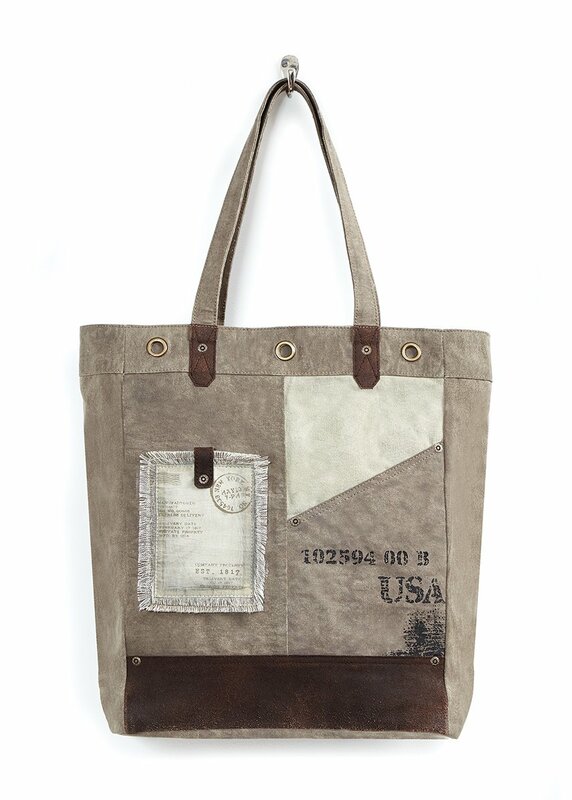 The Tahoe Canvas Tote has all the features that we love about a Mona B. bag: vintage-inspired design, upcycled canvas, screen-printed graphics, utilitarian hardware, and even a fringed patch. This tote is a great size for wearing over the shoulder, and yet is big enough to accommodate a tablet, library books, and your daily necessities. The front of the tote has a large open pocket imprinted with a number code and USA in black, and also a fringed cotton patch stamped with vintage postal markings. Other accents on the front include 3 metal grommets, metal rivets, and genuine leather details. Two canvas handles with 10" drop. Recessed zipper closure. The interior is lined with the signature Mona B. cotton lining, and has 1 large zipped pocket and 2 slip pockets. Tote measures 12"W x 16"H x 5"D. Made from recycled canvas from truck tarps and military tents. The fabric shows the history of its travels which may include stitch marks, minor staining and unique scars and bruises. Color variations and patches add to the uniqueness of each bag. Heavy cotton canvas and genuine leather.